Over the course of the past several years since I started cooking for myself I’ve built up a collection of different recipes and foods that are on a little thing I call my Cooking Bucket List. I’m sure many of you have ones of your own. They’re really just a list of foods that have yet to actually attempt making for myself but are still very interested in trying out….y’know, before I, kick the bucket. Some of these recipes (like souffle, candy or from scratch pastry cream) are rather complicated, which is the main reason why I haven’t tried them yet- having a fear that I’ll somehow mess it up and waste my time and the ingredients. Others (like standard ice cream, the Momufoku Milk Bar birthday cake, require me to have to make a purchase of some other kind of something that I don’t have ‘just’ to make this particular recipe. I’m not the most frugal person in the world but I’m also hesitant to go out and splurge on an ice cream machine or shop online for baker’s ammonia or acetate strips when I know I don’t ‘need’ to make something. Those are the first two types of recipes on my Cooking Bucket List. The third type, I’ve really got no fancy-dancy explanation for; they’re recipes and foods that wouldn’t really put me out of my way to make at all. They’re there, because I’m lazy and simply just haven’t gotten around to trying them out yet. Today’s post was one of those. 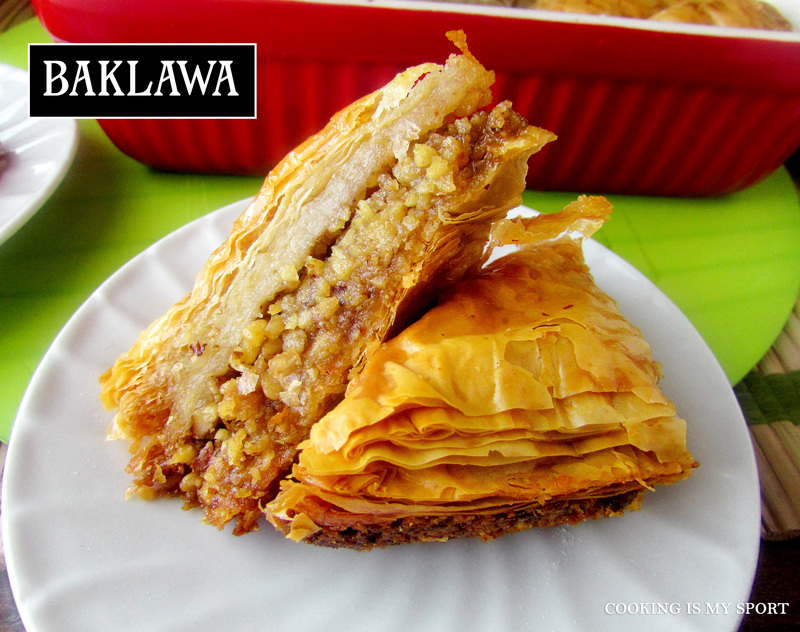 Baklawa is one of my favorite Middle Eastern foods and one of my overall favorite treats in general. 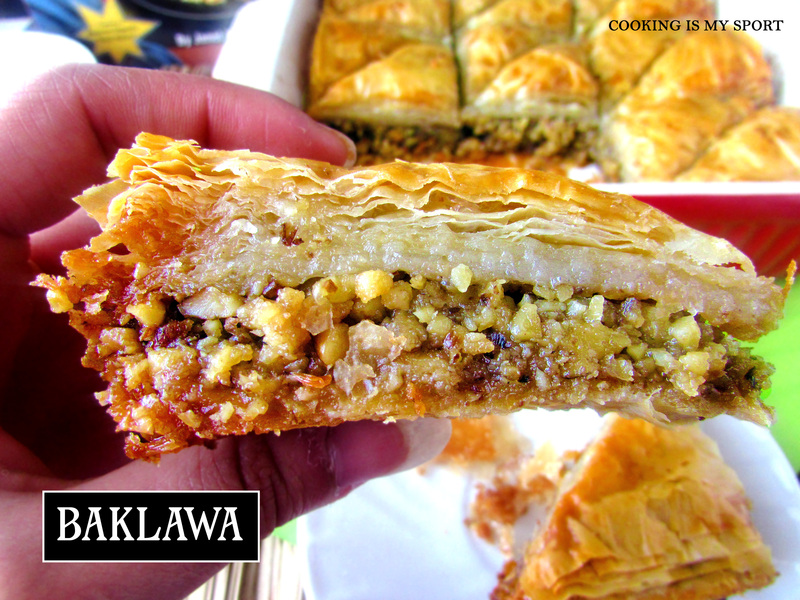 There’s a Middle Eastern deli nearby where I live that makes delicious baklawa, but I’ve still wanted to try it out for myself for years. There are several markets in my area that sell Middle Eastern and Asian cuisine ingredients so I was able to find orange blossom water pretty easily for a fairly inexpensive price. I’d never heard of it before this and from what I understand, just a little bit goes a LONG way. So as a side note, if any of you know of any recipes using orange blossom water besides baklawa, I now have a nearly full bottle of it just sitting on a shelf that I don’t really know what else to do with- if you happen to have any suggestions, I’m all ears. Now look guys, I know my first attempt at baklawa ain’t exactly the Belle of the Ball. It’s not as pretty as I would’ve wanted it to be and clearly my fillo layering skills could use some practice. But it was my first time and all, so cut me some slack. And in any case, the taste more than made up for the presentation, I can guarantee you. The fillo cooked up nice, crisp and golden brown. 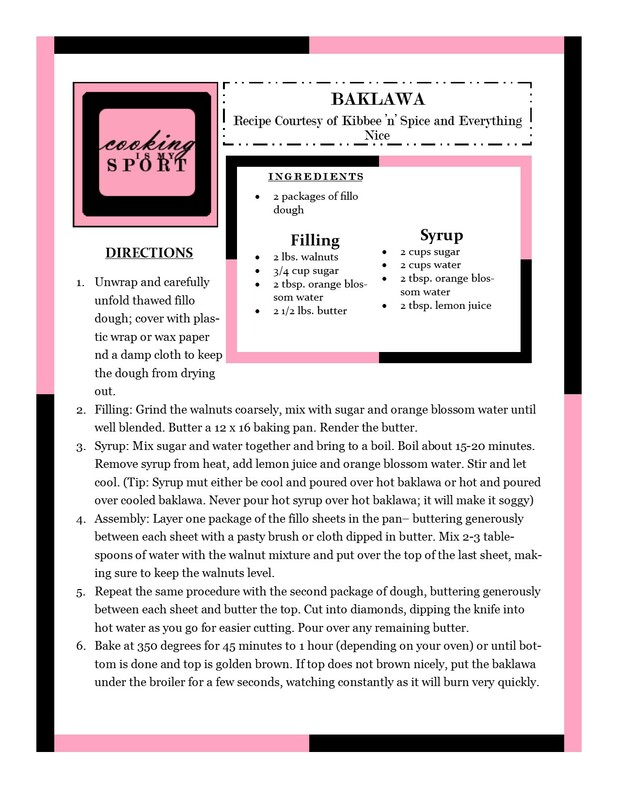 The recipe gives two options for how to handle the syrup: I chose the option of pouring the cooled syrup over hot baklawa right after I took it out of the oven, but doing it vice versa is an option as well. Whatever works for you. So yeah: that’s one item off my Cooking Bucket List. I guess now I have to go back and pick another to make. But first, guess I can share some of my Baklawa with the folks at this week’s Fiesta Friday #88, co-hosted this week by Julie @ Hostess At Heart and Liz @ spades, spatulas & spoons. Unwrap and carefully unfold thawed fillo dough; cover with plastic wrap or wax paper nd a damp cloth to keep the dough from drying out. Filling: Grind the walnuts coarsely, mix with sugar and orange blossom water until well blended. Butter a 12 x 16 baking pan. Render the butter. Assembly: Layer one package of the fillo sheets in the pan– buttering generously between each sheet with a pasty brush or cloth dipped in butter. Mix 2-3 tablespoons of water with the walnut mixture and put over the top of the last sheet, making sure to keep the walnuts level. Repeat the same procedure with the second package of dough, buttering generously between each sheet and butter the top. Cut into diamonds, dipping the knife into hot water as you go for easier cutting. Pour over any remaining butter. Bake at 350 degrees for 45 minutes to 1 hour (depending on your oven) or until bottom is done and top is golden brown. 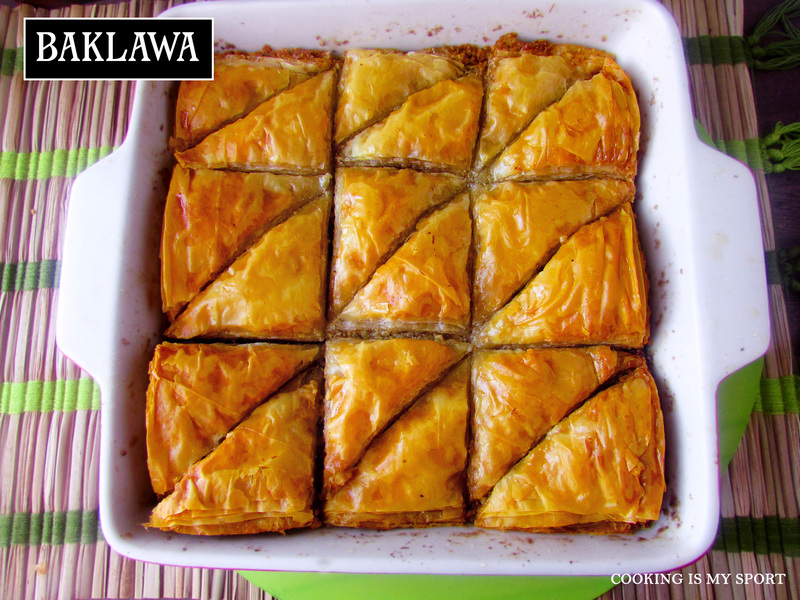 If top does not brown nicely, put the baklawa under the broiler for a few seconds, watching constantly as it will burn very quickly. As much as I’ve seen all over it’s basically the same, with very small nuances in each country. The only change I’ve made to the original recipe is that I use clarified butter rather than melted whole butter. 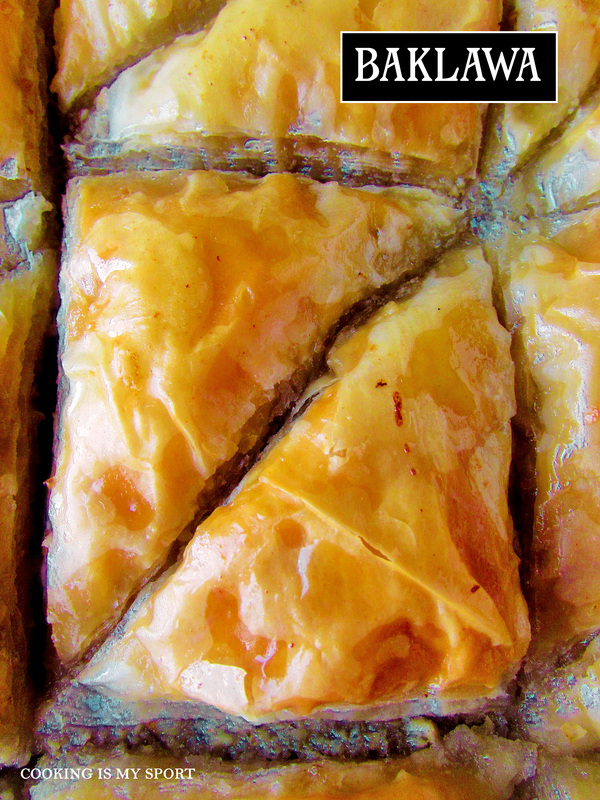 I find it makes the Baklava less heavy. I love badlawa, but have never been ambitious enough to try it! Your first attempt was borderline professional! I think I would have eaten the whole pan! 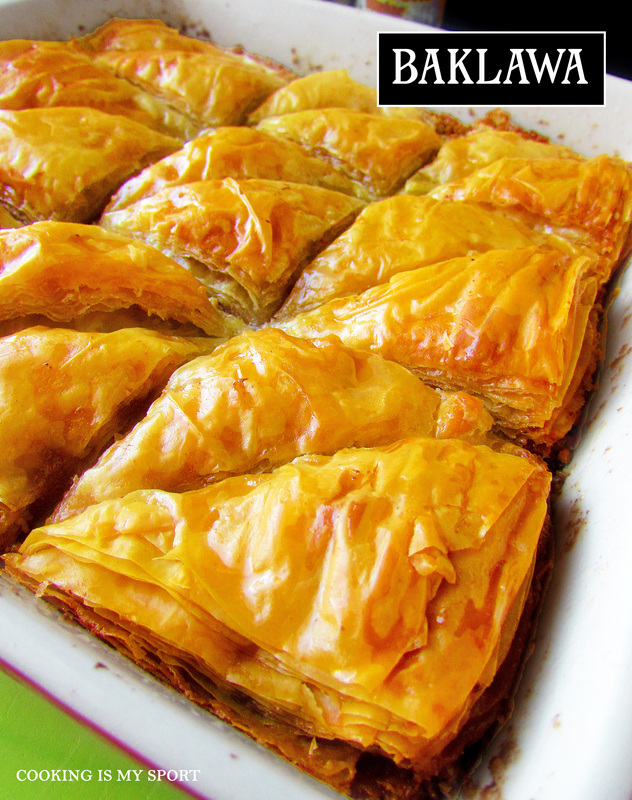 My mama asked me not long ago if I had ever made baklava. The way she asked it was like she wanted me to make it and share it with her. Now I have a recipe to make it. Thanks for sharing! This is DEFINITELY a good recipe to try Debbie. Thank you! And this is your first time?! Could’ve fooled me! I haven’t tried orange blossom water (sounds fabulous!) but I have a bottle of rose water I need recipes for. Tell you what, if you look for rose water recipes, I’ll look for orange blossom recipes. Deal? Thanks Angie, that means a lot coming from you. This looks very professional! Working with filo dough has been on my bucket list as well, both savory and sweet. Then I have officially done my job right lol Thank you!